True Blue's pop'n music banner. What happens to a heart when love ends? Does it fade into a shadow of remorse, when it bends? Where do the teardrops go when they dry? Do they follow all the raindrops and return to the sky? Oh I think a heart always learns to be strong. Where did the sorrow go? Who gave me back the sun? The beatmania IIDX version of True Blue is extended by 8 measures. This version is also used in pop'n music. However, the pop'n music Sunny Park original soundtrack vol.2 album uses the shorter version of True Blue. A remix of True Blue by DJ Command, titled True Blue [DJ Command Mix], can be found in REFLEC BEAT VOLZZA. True Blue appears as part of POLICY BREAK Medley from SOUND VOLTEX×jubeat, which appears in SOUND VOLTEX IV HEAVENLY HAVEN. True Blue is the final unlock of jubeat saucer's bistro saucer 4th Set. It could be unlocked from January 1st to 31st, 2013 after all other 4th Set songs are unlocked. True Blue could be unlocked from February 27th, 2013 to March 3rd, 2014 in beatmania IIDX 20 tricoro/21 SPADA as part of the Café de Tran unlock system. It was the sixth unlockable song for those games. True Blue can be unlocked in REFLEC BEAT colette -Spring- from April 1st, 2013 as part of the Pastel-kun to Smith-shi no RUNRUN marathon! (パステルくんとスミス氏のRUNRUNマラソン!) crossover event with jubeat saucer. It is the first unlockable song of the 2nd Meeting, after Smith-shi completes 10 laps around the track. From REFLEC BEAT groovin'!! to REFLEC BEAT VOLZZA 2, True Blue was playable by default. True Blue is one of the songs part of the Mimi, Nyami & Kotaro no flying catch! (ミミニャミ・コタローのフライングキャッチ！) event. It could be unlocked in pop'n music Sunny Park since June 3rd, 2013. From September 12th, 2014, it could be unlocked in pop'n music ラピストリア via Story Mode. True Blue is a song part of the POLICY BREAK event. For more information on the dates it can be unlocked in the SOUND VOLTEX series, please see the event page. From November 15th, 2018, it can be purchased with BLOCKs instead. True Blue was added to DanceDanceRevolution (2013) on December 25th, 2013, as part of the Nettou! BEMANI Stadium (熱闘！BEMANIスタジアム) event. Since July 24th, 2014, True Blue can be unlocked via EXTRA ATTACK in DanceDanceRevolution (2014). In DanceDanceRevolution A, it can be unlocked through EXTRA SAVIOR. From DanceDanceRevolution (2014) onwards, True Blue appears in the DanceDanceRevolution (2014) folder instead of the (2013) folder. True Blue was crossed over in every BEMANI crossover event which involved jubeat saucer, with the exception of the jubeat・GITADORA・DDRのTriple Journey event. True Blue is one of the songs featured on the BEMANI SONGS ～Best of jubeat～ video. 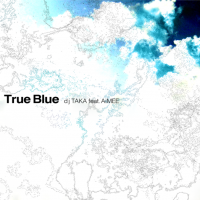 After being removed from the initial release of REFLEC BEAT 悠久のリフレシア, True Blue was revived on April 5th, 2018. True Blue [ 2 ] can be unlocked in jubeat festo from November 27th, 2018, as part of the TUNE RUN unlocking system. True Blue is available in beatmania IIDX INFINITAS as part of the beatmania IIDX INFINITAS 楽曲パック vol.5. True Blue can be unlocked in ノスタルジア Op.2 as part of the NOSTALGIA×jubeat gakkyoku koukankai (ノスタルジア×jubeat楽曲交換会) event. It can be unlocked from March 27th to April 16th, 2019 by playing jubeat 6 times. True Blue received a Real chart on April 4th, 2019. ノスタルジア difficulty rated from 1 to 12 for Normal to Expert charts. Real charts rated from 1 to 3 diamonds (◆). This page was last edited on 9 April 2019, at 16:50.